Dozens of people protested Tuesday night in the town of Adam, just north of Jerusalem, one day after a police officer suffered moderate injuries in a terrorist attack in the area. “We’re calling on the government of Israel and the Prime Minister to stand up and defeat terrorism. This situation cannot continue,” declared Avi Roeh, head of the Binyamin Regional Council. “The government of Israel must restore residents’ sense of security,” he said. MK Yoni Chetboun (Jewish Home), who was at the rally, suggested that the “random” terrorist attacks targeting Israelis in recent weeks are part of a strategic plan. The number of terrorist attacks is on the rise, and hit a new high for the year in November. “The Palestinians realized that they cannot defeat us with an open Intifada. As a member of the Foreign Affairs and Defense Committee... we’ve seen this new phenomenon of a ‘trickle’ of terrorism, in order to leave some slack in the rope,” he said. 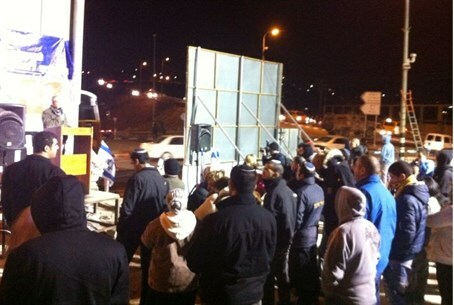 The protesters said tehillim (Psalms) as a prayer for the recovery of the injured police officer. Officer Rami Ravid regained consciousness on Tuesday, but lost a kidney as a result of the attack.